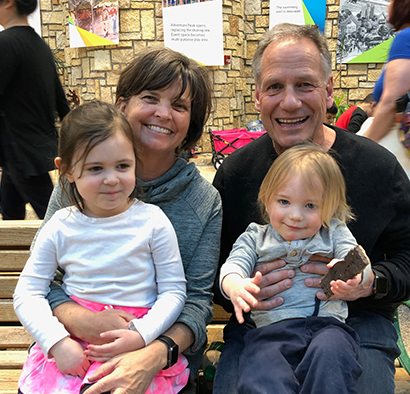 Last week we got to hang out with Megan, Josh and the grandkids! We live far apart so when we spend time together, it’s really special. And of course, since I love all things child development, it’s fun to see how the kids have grown, what they like to talk about and what they’re learning. You just can’t get all that with FaceTime! Luka will turn 2 in about a month, Cadence is nearly 4, so they like to play, play and then play some more – all day, every day! Repetition and exploration is the name of the game when it comes to hanging out with these two. Mimi, Pops, Cadence and Luka. Minneapolis has so many great indoor play spaces for families! 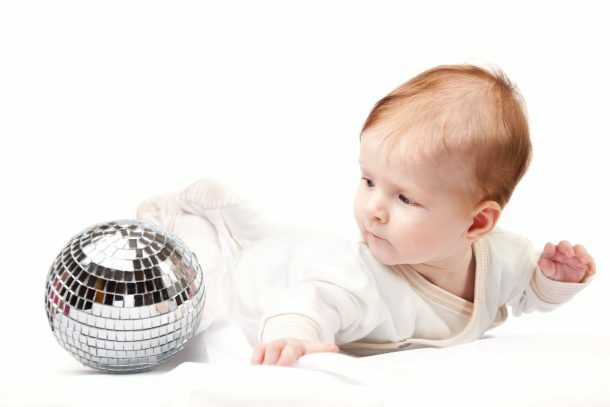 One morning, as I was sitting on the floor reading some books with Cadence, Luka was nearby playing with toys. After a few minutes, I turned and behind me he had made two long lines of blocks, parallel to each other, nearly the same length. What seems like no big deal, simply lining up blocks, is actually very telling! He’s a little bit ahead! By making a horizontal row of blocks, he’s in Stage 2 of block building, which happens at age 2-3 years. Click here to learn about the Stages of Block Building! By sitting right next to us and playing, not participating with what Cadence and I were doing but content to do his own thing, he was demonstrating parallel play. That means he’s good to play near others, but not necessarily with them. He’s not quite ready for cooperative play at age 2. The blocks were about 3-inch squares, easy for his little 23-month-old hands to grip and manipulate. Playing with blocks helps develop small muscles and eye-hand coordination. When presented with a plastic bin of blocks, his choice was to first dump them, then put them side by side in a row. This desire to create line and pattern from a jumble of blocks shows me that he’s interested in creating design – which is a form of art! Once you’ve mastered creating a horizontal line of blocks, next comes a tower! The next characteristic of Stage 2 block building is to create a vertical or stacked row. Making a tower with blocks is very exciting as you have to balance them just right so they won’t fall. There’s lots of wobbling involved as children practice this skill! Eventually they learn to place blocks so they’re more stable and towers will get taller and taller. 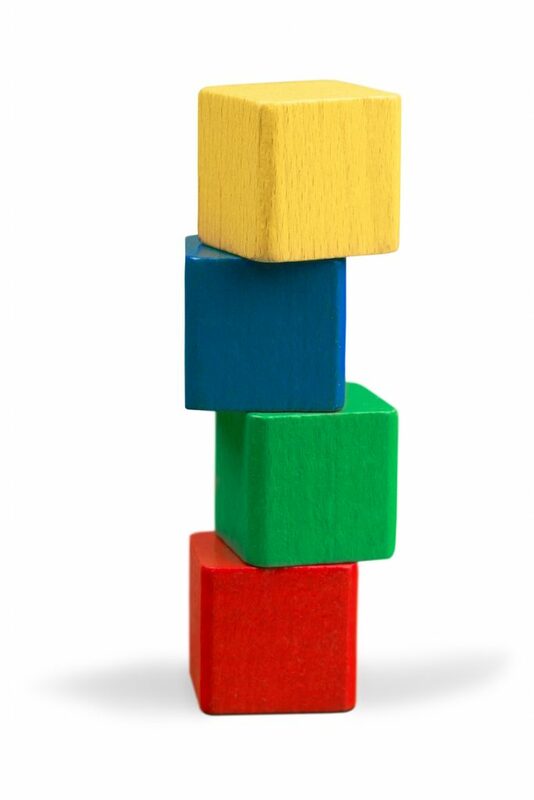 In fact, how many blocks you can stack is an assessment measure for cognitive development. Then there’s the satisfaction of knocking it over! Brings a smile every time, when YOU’RE the one who knocks it over. Someone else doing it for you? Well, that gives the chance to practice social skills as they express either joy or frustration that the tower is now destroyed. 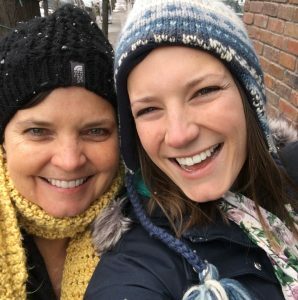 Building it again together allows for collaboration, communication and the joy of shared experience. At 23 months of age, Luka wasn’t concerned later in the day when we went back up to the playroom and all the toys, including the blocks, had been placed back in bins and put on the shelf. He didn’t seem to even remember his block creation from a few hours ago. Later, when he’s around 4 years old, as his block structures become more imaginative, elaborate and complex, it will be really important to respect his hard work and save it as long as he wants, if possible. The power of intentional observation. 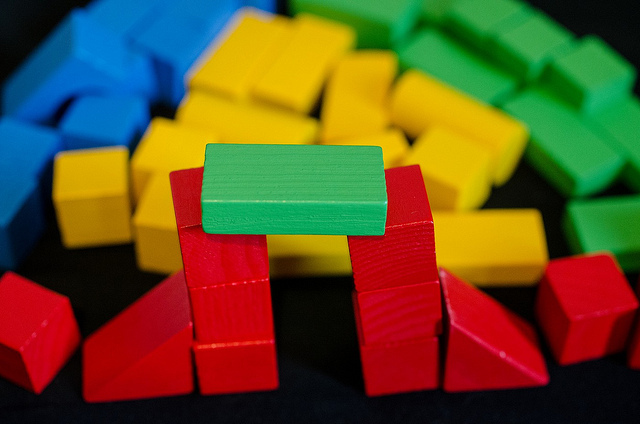 Observing something as simple as playing with blocks gives much understanding of a child’s inner world. We can imagine how they’re thinking and gain insight into their learning. By providing the right toys and asking open-ended questions we nudge them forward developmentally, providing a strong foundation for math concepts, science understanding and social interactions. These early years really do matter. So pull out those blocks and play with your little one! Nobody loves your baby like you do.